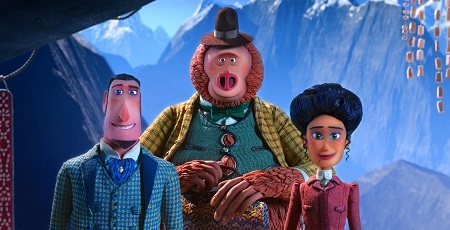 Eccentric explorer Sir Lionel Frost (voiced by Hugh Jackman), eager to prove himself to the staid and traditional London adventurer community, heads to the United States and the wilds of Pacific Northwest logging towns in search of the legendary Sasquatch. He has received a letter ensuring him of the creature’s existence, and never one to bow to convention Sir Lionel makes the 4,800-mile trip with the belief he is about to make history even though the majority of his peers scoff at what they see as nothing other than idiotic foolishness. This laughter includes the haughty guffaws of Lord Piggot-Dunceb (Stephen Fry), the elder statesman of British adventurers refusing to accept that a creature like the Sasquatch could exist as its doing so would be an affront to traditional theology as well the scientific status quo. Turns out, not only is this Sasquatch (Zach Galifianakis) real, he’s the one that sent the letter to Sir Lionel asking him to come to Washington state and “discover” him. The gregarious creature is tired of being alone. He wants to meet more of his own kind, and after hearing stories of the mysterious Yeti that roams the mountains of the Himalayas, he figured Sir Lionel would be up to the task of assisting him in traveling around the globe in order to go and meet his snow-loving cousins residing in the undiscovered kingdom of Shangri-La. The bold explorer agrees, and after christening his tall, hairy new acquaintance Mr. Link (short for “Missing Link”) and a brief stop on the Mexican border to pick up the only known map of the Himalayan region they are off to from sassy widow Adelina Fortnight (Zoe Saldana) who subsequently joins them on their quest, they leave on a journey that’s practically guaranteed to change their lives forever. The latest animated sensation from the stop-motion maestros at Laika, the studio behind such family-friendly wonders as Kubo and the Two Strings, The Boxtrolls and Coraline, writer/director Chris Butler’s (ParaNorman) marvelously entertaining Missing Link is a joyous absurdist frolic that’s nothing short of wonderful. It is a freewheeling, energetic cross-continental adventure overflowing in good vibes, endearing life lessons and eccentric characterizations. It also offers up a few startling surprises, some of which are shocking in their violent finality, Butler’s sophomore outing unafraid to show just what happens to those who choose ignorance, anger and intolerance as their guiding principles, their blind eye to science, acceptance and compromise the key to their own undoing. The core of the story is unquestionably the growing friendship between Sir Lionel and Mr. Link. There’s a stupendous moment where the explorer asks his new compatriot his first name, the look of shock that crosses over the Sasquatch’s face when this happens is immediately coupled with a bright smile of ebullient delight as the animal is touched that someone, anyone, would take even a second of time to ask such a question. But the reality is Mr. Link has no first name. His parents never gave him one, and as he’s been living in the forest for most of his life there’s just never been a real need to come up with one. But this doesn’t stop the Sasquatch from knowing what he would like to be called, of him having an innate sense of who he is and what name he would like the world, especially those he considers his friends, to call him by. What’s great about this moment is that, while initially played for a few tittering laughs, Sir Lionel immediately understands how important it is to Mr. Link to be called by his chosen name is. There is no hemming. There is even less hawing. Instead, he and Adelina immediately start referring to the Sasquatch by the name he has given himself, which brings the creature a sense of empowered confidence that allows him to become nothing less than a selfless hero by the end of the film. It’s this little act of kindness, this understanding that to accept someone for who they proclaim to be can bring a powerful positivity to their lives unlike anything they’ve ever known before, and it’s moments like this that help give Missing Link an enduring joie de vivre that’s incredible. The animation is stupendous, the folks at Laika once again proving to be masters of their craft. So many sequences just blew me away from a visual standpoint, Sir Lionel, Mr. Link and Adelina’s arrival in Shangri-La crossing over a massive ice bridge that looks over a mist-covered cavern just plain stunning. The character designs are also so meticulously inventive I was frequently in a state of perpetual awe as I analyzed all of their varying facets, the Yeti ruler a notable standout that made my heart jump in giddy glee the second she was introduced. There are villains here, and as I’ve stated Butler doesn’t exactly pull his punches as to what he thinks about the lot of them. He unsympathetically, and rather unsubtly, draws ominous parallels between many of them and current religious and political leaders of today. Even though his film takes place during the tail end of the 19th century figures like the duplicitous Lord Piggot-Dunceb or his hired assassin Stenk (a magnificently cast Timothy Olyphant) aren’t that far removed from the intolerant rabble-rousing fearmongers we see on Cable News channels as pundits or hear spewing their hatred on YouTube or Twitter on a daily basis right this very second. Butler doesn’t so much make fun of these bad guys so much as he instead shows them to be the fools they are. More, he makes it clear that their time is reaching its conclusion, and while they will continually attempt to fill any room they are in with their hot air and fanatical gobbledygook, at a certain point the world can, should and hopefully will unsympathetically pass them by. They are figures of the past while figures like Sir Lionel, Mr. Link and Adelina are the heroes of the future, and seeing all three of them discover this for themselves ends up being one of this story’s lasting charms. 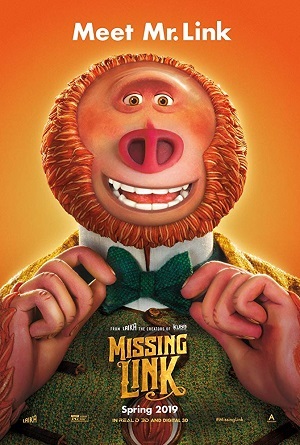 Missing Link is an amusing romp into the imagination that won a lasting place in my heart, and for Laika it’s another stop-motion triumph that might just be the animated studio’s best film yet.